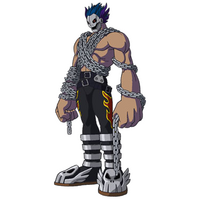 For the Death Meramon in C'mon Digimon, see Death Meramon (C'mon Digimon Version). 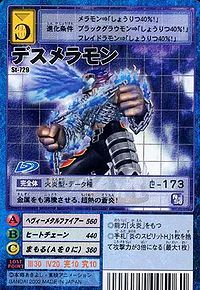 An evolution of Meramon, this Digimon's body is cloaked in blue, high-temperature flames. The flames that arise from its body blaze brightly in blue, as these flames burn hotter than Meramon's. 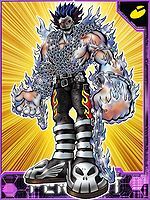 Its offensive and defensive abilities have risen considerably, which in conjunction with the strength of its flames, bestow upon this power-type Digimon tremendous destructive power. 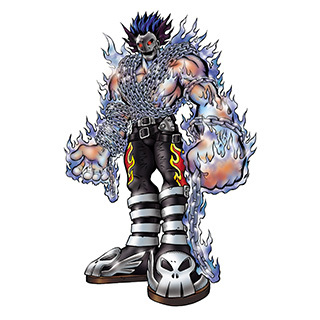 Although Flame Digimon tend to be weak against Aquatic and Ice-Snow type Digimon, fighting the strength of Death Meramon's flames with them is as futile as pouring water on a hot stone. 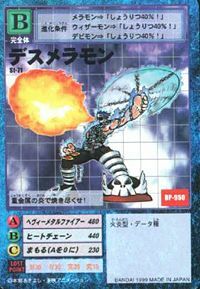 Its Special Move is melting the heavy metal within its body, and spitting it out at the enemy (Heavy Metal Fire). — Digimon Adventure: "Tokyo Tower is Hot! Death Meramon"
| Meramera (めらめら) means to burn. | Meramera means to burn. 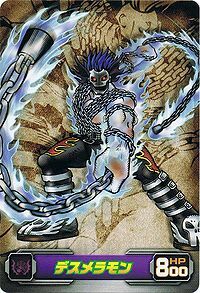 Anime/Manga Digimon Adventure: "Digimon, the Great Tokyo Crossing"
ヘヴィメタルファイアー Hevi Metaru Faiā Metal Fireball/Heavy Metal Fire Spits out heated metal from its body. 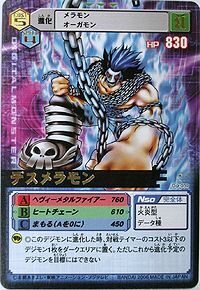 ヒートチェーン Hīto Chēn Flame Chain/Chain of Pain Attacks foe with a flaming metal chain. 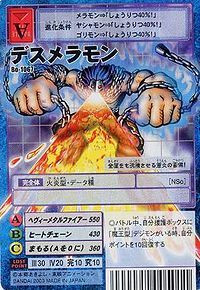 Heat Chain Midareuchi  Heat Chain Random Pounding ヒートチェーン乱れうち Hīto Chēn Midareuchi Blazing Iron Whip Manipulates flaming chains to attack multiple opponents. Death Meramon was one of Vamdemon's minions. A Death Meramon in hat and trench-coat was among the shadowed Digimon that wanted Makino Ruki to tame one of them. Another one was seen through the rip in the sky during Vikaralamon's rampage. 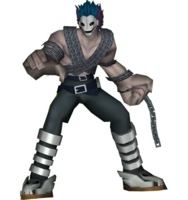 Death Meramon is Ancient Volcamon's second-in command. He has Blue Meramon and several Meramon working for him. 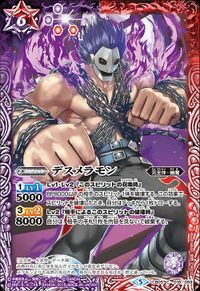 Death Meramon is an obtainable Digimon by evolving Meramon with 6+ DP, Tankmon with 6+ DP and Clockmon with 8+ DP. Can evolve to Boltmon with 0+ DP. Death Meramon is a random enemy in Asuka's fire dungeon. Evolves from Meramon or Wizarmon. 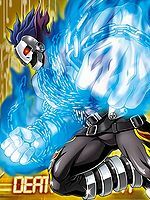 Can be Jogressed with a compatible Digimon to get Boltmon. 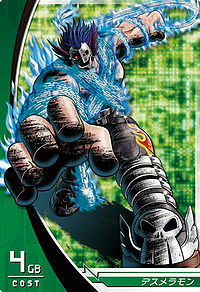 Death Meramon is an enemy Digimon in Area 06 and 07. 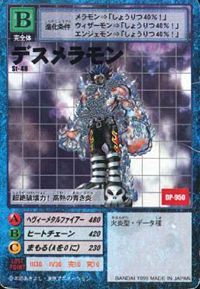 Death Meramon is an unobtainable Leader Digimon. 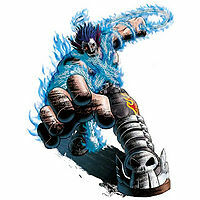 Its super hot blue flames have supreme destructive power! 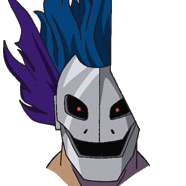 It'll burn you with his heavy metal flames! This demon man from purgatory sets heavy metal ablaze! Its super-heated blue flames boil even metal! This blue-flamed warrior boils even metal! The strongest form of the Meramon-species, which has overcome its weakness to water and ice. 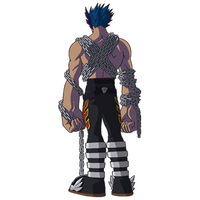 A chain that blazes with blue fire is coiled around its body, which has been strengthened in all areas such as attack, defense, and heat intensity. 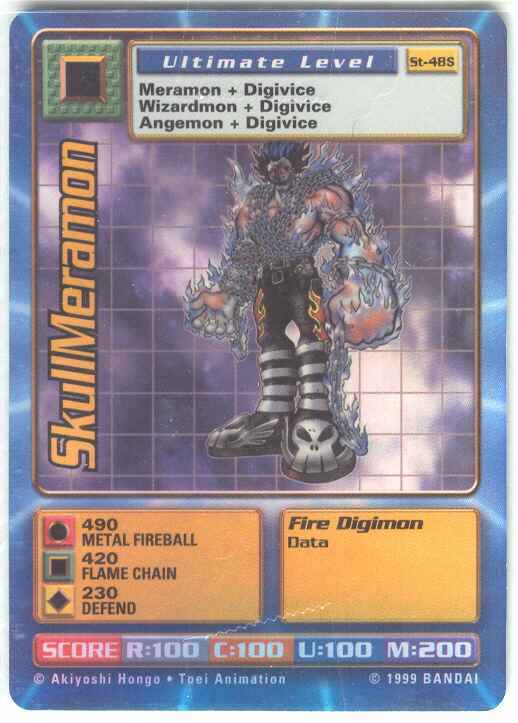 An evolution of Meramon, this Digimon's body is cloaked in blue, high-temperature flames. The flames that arise from its body blaze brightly in blue, as these flames burn hotter than Meramon's. ↑ Digimon Xros Wars: "Volcano Digimon, A Great Eruption!" This page was last modified on 21 March 2019, at 17:27.